I’m so proud of my little Ravynn today. Last winter, my friend Kim and I started roaming the old cemeteries in the area taking photos to help out with some needed tasks at Find a Grave. As I am an amateur genealogist, it seemed the right and proper thing to do [before I could feel good about posting my own requests]. Taking photos for those requests, while still very important, morphed into taking photos for our own enjoyment. Truth is these stones won’t be around forever. Even in a few months, we saw serious deterioration in one of our more frequently visited locations. Photography helps preserve them – just a little. When the kids were released from school from the summer, they started coming with us. I’d replaced my first digital camera with a newer version, so I’d bring along ‘the old one’ and let the kids take turns snapping pictures. Because there are four of them, I’d occasionally hand over the newer camera and let them play. I love digital cameras for the ‘no risk’ aspects! 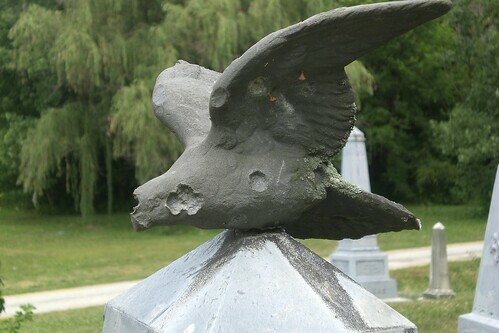 On a visit to Seigler Cemetery in Frankton, Indiana, Ravynn captured this photo. When I started listing some of my own work on our Etsy site, she asked me to list a black-and-white version of her photo. I was happy to do it – I love this photo! Several times a day, she’d come to me and ask if any sold yet. I’d been warning her it could take a couple weeks or a month – even longer – for a sale. Well, only two days in, when we returned home from dance classes last night, she checked email and found a sale. Ravynn has sold a photo. A professional at age 8. Now, we’re all hoping for a short winter, so we can get back to work without freezing our fingers.